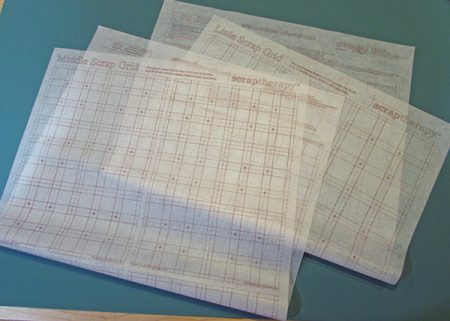 The Scrap Therapy Mini Scrap Grid interfacing was developed following the publication of the book, ScrapTherapy, Scraps Plus One! The Middle Scrap Grid and the Little Scrap Grid have been added to the collection of 9-patch grid interfacing. 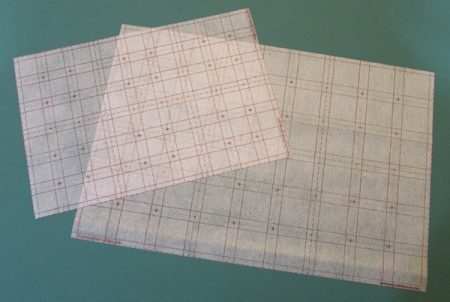 All three interfacing products are available by the panel. 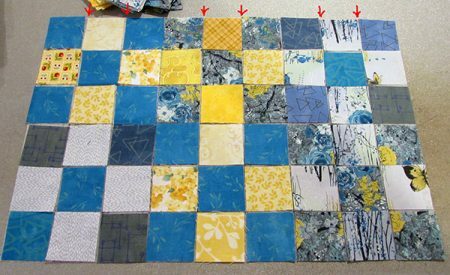 The Middle Scrap Grid (‘Middle’ for short) turns 1-1/2″ squares into 3-1/2″ 9-patch blocks and the Little Scrap Grid (‘Little’) turns 2″ squares into 5″ 9-patch blocks. Like the Mini Scrap Grid, both Middle and Little break down into smaller clusters of nine-patch grids to make the sewing less cumbersome. Different from the Mini Scrap Grid, instead of clusters of nine 9-patches, Middle and Little have clusters of six 9-patches. 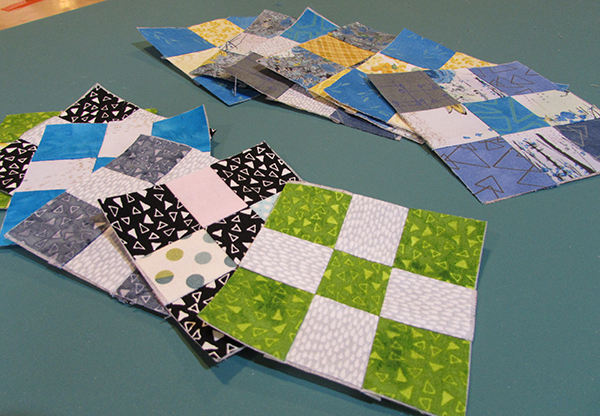 Each panel of Middle Scrap Grid consists of four clusters, and makes 24 9-patch blocks. 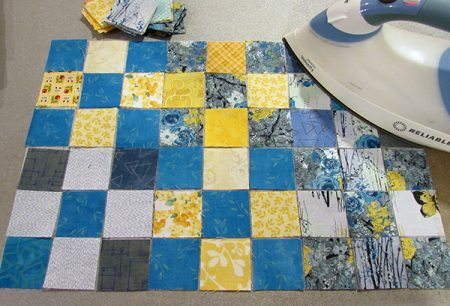 Each panel of the Little Scrap Grid consists of two clusters and makes twelve 9-patch blocks. 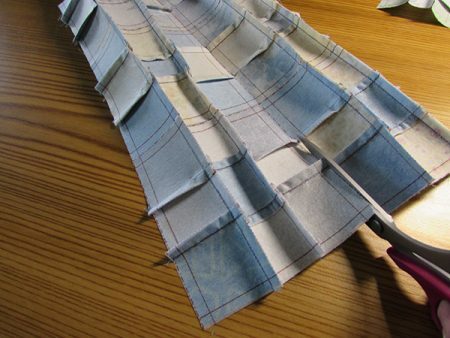 Essentially, except for the scrap fabric sizes used, the instructions for Middle and Little are the same, so you may see the samples flip from one size to the other in this tutorial. And I bet you won’t even notice the difference! First, trim any extra interfacing away from the cluster to avoid getting the fusible glue on the iron, then place the grid on your ironing surface, fusible side up. Arrange scrap squares (1.5″ scraps for Middle and 2″ scraps for Little) on the grid aligned with the dotted lines. Then press with a hot iron with maybe a puff or two of steam, no more. Next, we’ll sew the vertical seams (see the red arrows at the top?). Fold the panel cluster right sides together so the first dotted line is directly on the turn of the fold. 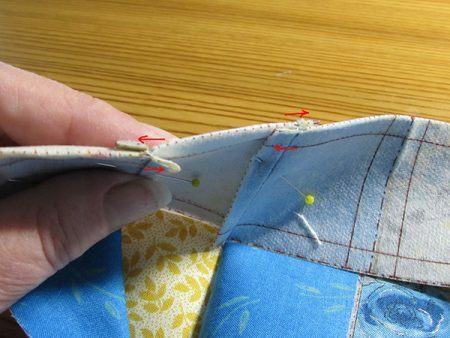 You’ll immediately see the solid sewing line, but before you sew, make sure the sewing line on the front is aligned with the solid sewing line on the back by sticking a pin front to back in several spots along the line. Once you’re certain the line is aligned front to back, secure the layers with pins . . .
. . . and sew on the line. 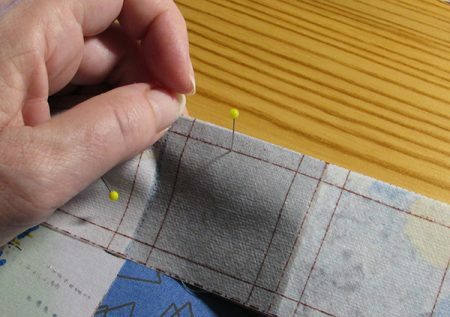 Before moving on to the next fold and seam, double check to make sure the sewing on the bobbin side falls right in line with the printed line on the interfacing. Then fold, pin, and sew the next seam as before. Here’s another difference between the Mini Scrap Grid and Middle and Little, the solid sewing line appears along all the dotted folding lines and dot-dash cutting lines. This will come in handy for some of the patterns using Middle and Little. 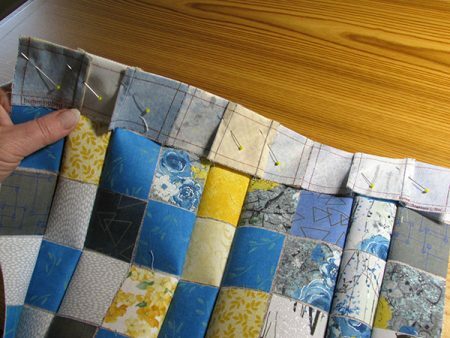 To make basic 9-patch blocks, you’ll want to skip the seams where there is a dot-dash line! 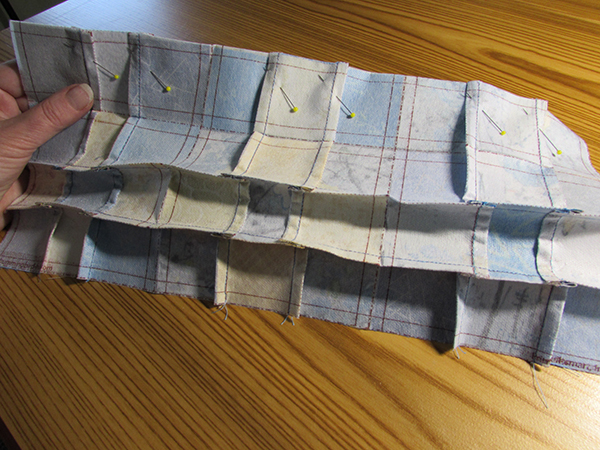 Once all six seams are sewn, this is how the interfacing side of the panel cluster looks. 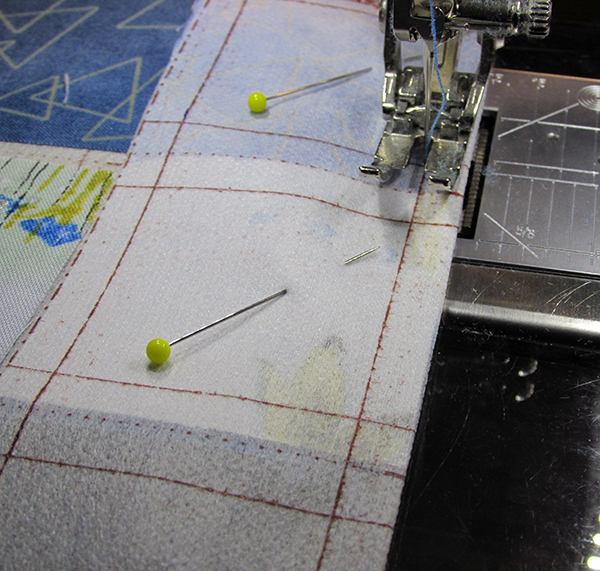 Next we’re going to sew the horizontal seams (red arrows on the right). But before we do that, snip the seam intersections at the cross-hair markings that look like an extra bold PLUS sign (+), circled in red. 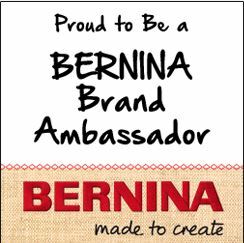 When you snip, be sure to cut through the stitching! This is really important. Notice that I didn’t snip at the big dots or where the dot-dash lines intersect. Those lines are there for some patterns, but not used when making a basic 9-patch block. 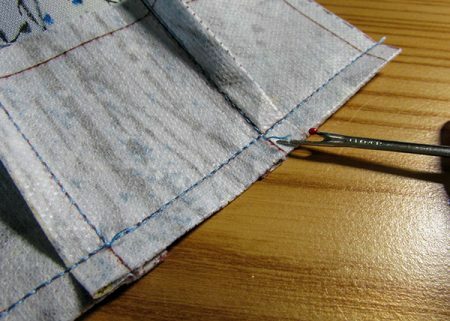 To sew the horizontal seam, fold on the first horizontal dotted line. Like before, make sure the dotted line falls directly on the turn of the fold and that the solid lines are in line front to back. 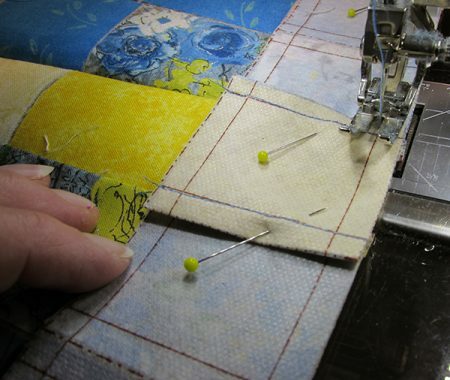 IN ADDITION, nest and oppose the seams so they create ‘innies’ (seams finger pressed toward each other) and ‘outies’ (seams finger pressed away from each other) in each 9-patch-to-be. See the red arrows? On the front side, the seams and arrows are going toward each other and on the back side the seams and arrows are going away. 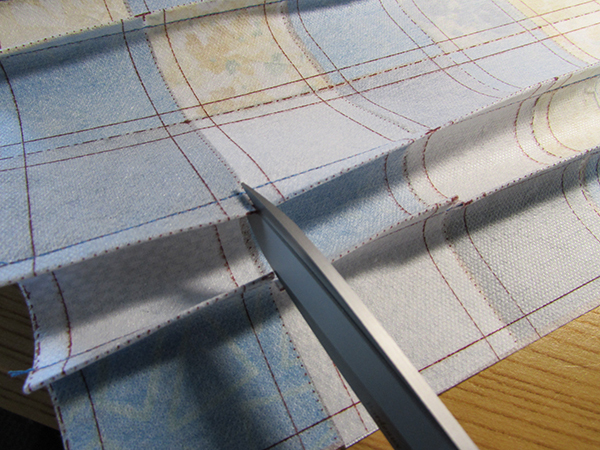 Be sure to snap the seams into place like you normally would when piecing without interfacing. 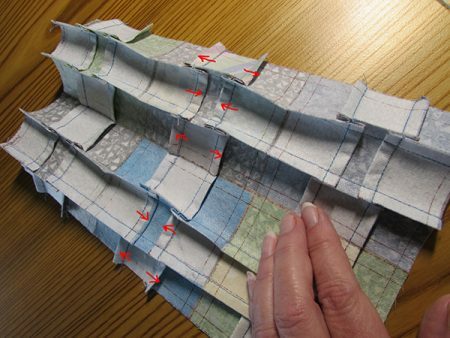 For the basic 9-patch block, it doesn’t matter if the seams in front are innies or outies in the first row, however, some patterns will specify seam direction. Do you see that the front seams in the 9-patch to the left are going toward each other, while the seams in the middle 9-patch and the 9-patch on the right are going away from each other. 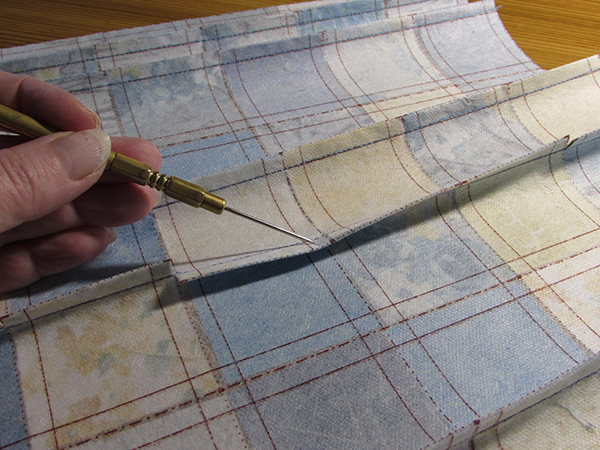 Once the seams are secured with pins, sew on the solid line as for the veritcal rows. 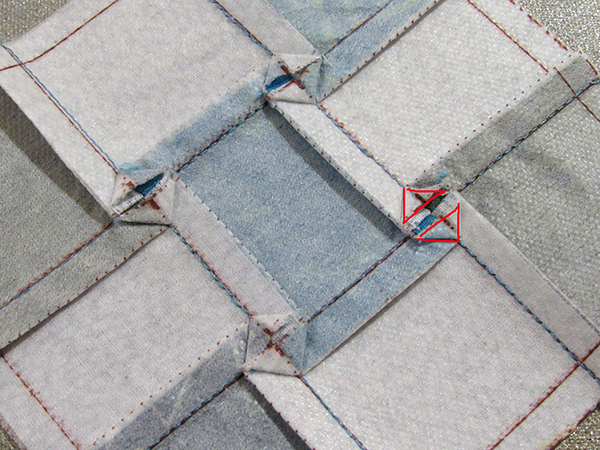 Once again, for the basic 9-patch block, skip the seam nearest the dot-dash line. All the seams are sewn. Here’s the front view. 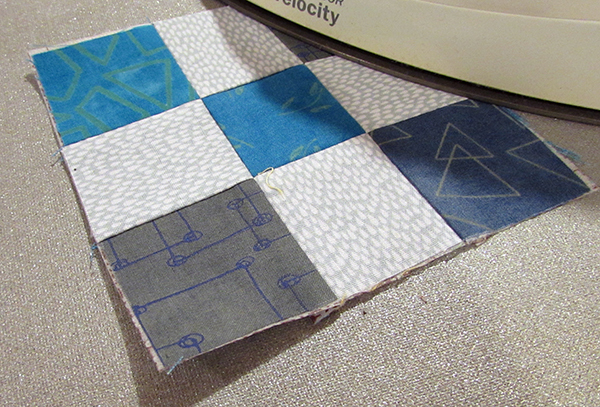 It’s a bit of a hot mess because we haven’t done any pressing (except finger pressing) since we fused the squares to the interfacing way back when. Flip the cluster to the wrong side and you can see those innies and outies! 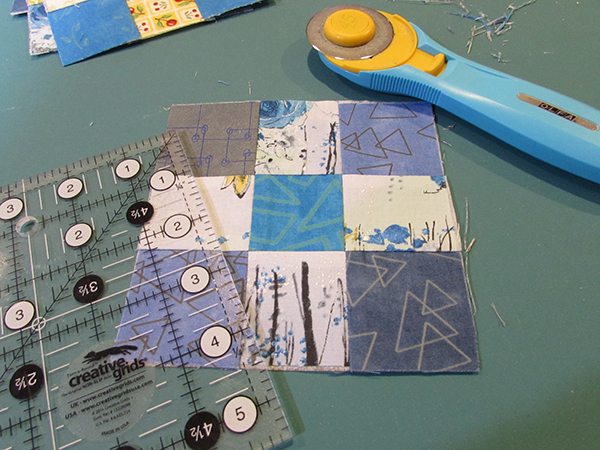 Cut the 9-patch blocks apart on the dot-dash lines. I love to furl (it’s also called pop, twist, twirl) the seams. 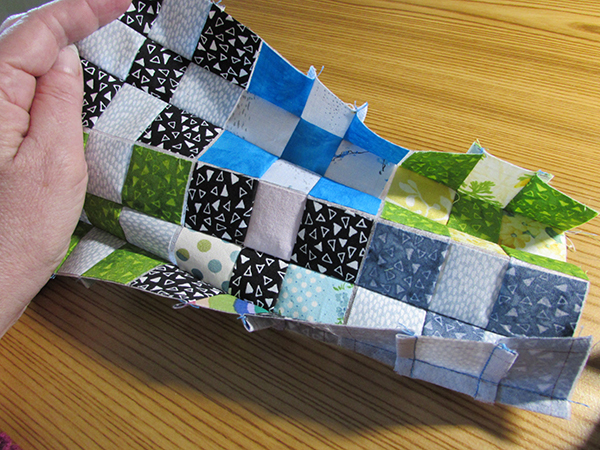 This is particularly common with 4-patch blocks, and it compresses the bulk at the seam intersections beautifully. 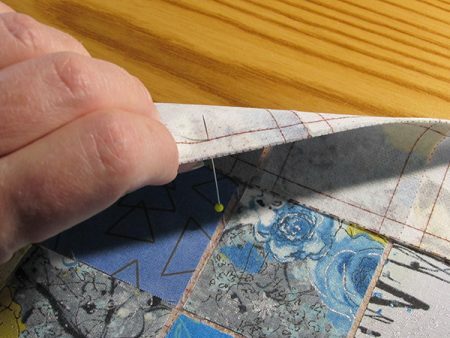 But you can also furl the seams in 9-patches as long as the seams have been pressed alternately (the innie and outie thing again). To furl, before pressing the block, pull out the last two or three stitches between the fabric fold (this is close to where the interfacing was snipped earlier). Repeat this on both sides and for all four seam intersections on each block. Place the block right side down on the ironing board. 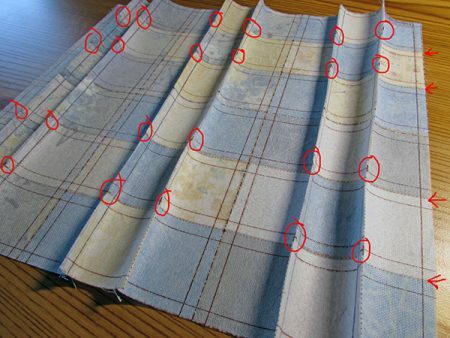 Look at each seam intersection individually. You should see two seems opposing (red arrows, upper seam intersection). 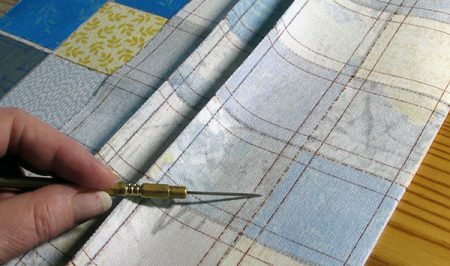 This will determine whether the seam will ‘furl’ counter clockwise, or, as in the case of the seam intersection below, clockwise. 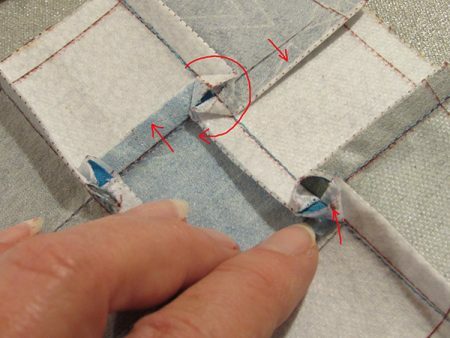 Push the remaining two seams to create the rotation. At the same time, a little bowl shape will form in the middle (see the seam intersection below to the lower right), push the side of the ‘bowl’ toward the center and flatten. . .
. . . to make two squished triangles. Then press from the right side. 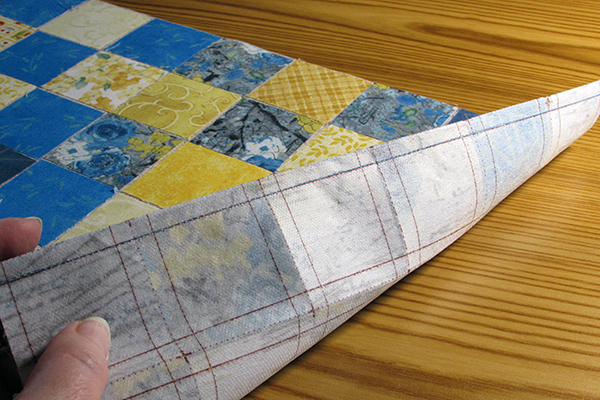 Trim the block–Middle to 3-1/2″, Little to 5″–square. Each cluster will yield six 9-patch blocks . . .
Did you realize that the Mini Scrap Grid makes 2″ 9-Patch blocks, the Middle Scrap Grid makes 3-1/2″ 9-patch blocks, and the Little Scrap Grid makes 5″ 9-Patch blocks. 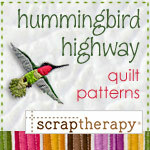 My favorite scraps sizes following the ScrapTherapy technique are 2″, 3-1/2″, and 5″. . .Coincidence? I think not!